These lovely earrings seems to float as they are so light and delicate. 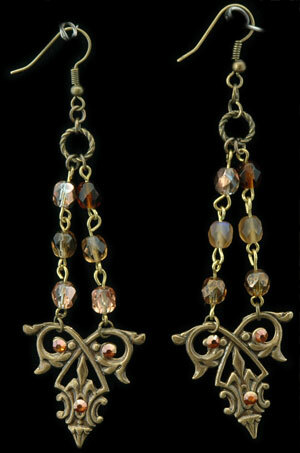 Austrian crystal beads in AB shades of metalized gold and amber tones hold a simple antiqued gold brass filigree studded in tiny Swarovski Crystal Amber stones. Goes beautifully with my “Royal Pair” necklace. Hangs 3” long from antique brass earring hook.